Of course I do too, but I am strapped for money and can’t eat so often (wry smile). 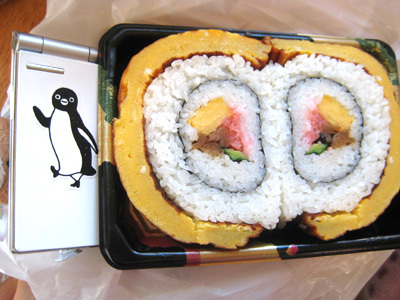 At least, I found an interesting post about sushi in a Japanese blog. 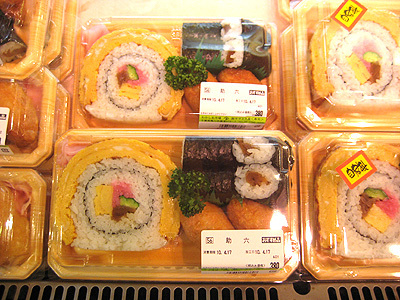 This blogger found this at a supermarket in [W:Chiba Prefecture]. but the futomaki (thick rolled sushi) in the left is too big! Compare to cell phone, these sushi are strangely big. They are like Doraemon’s eyes and too big to bite. The blogger said he used chopsticks to cut into small pieces to eat. This type of big rolled sushi is sometimes sold for celebration or some sort of special occasions but never found so normally on un-special day. We Japanese think it’s “BIG” but people in other countries might think it’s “regular” sized LOL. 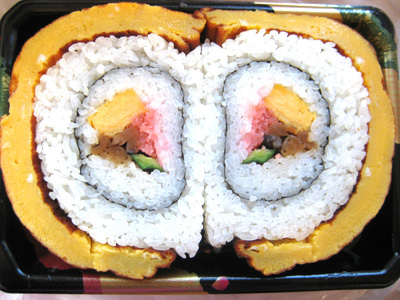 Now that I am writing this, I feel like eating sushi. Ah, it just came up in my mind but I don’t have to buy it. I should make it on my own.